A treasury of short musical pieces for home, church and school, featuring Christmas prayers, bedtime prayers, prayers of petition, prayers of thanksgiving and praise and many more. Children will love listening to and learning prayers that are used by children from different ethnic and cultural backgrounds. Based on sources ranging from international folklore to the devotional writings of poets and saints, this treasury of short musical pieces for home, church and school includes; Christmas prayers, bedtime prayers, prayers of petition, prayers of thanksgiving and praise, and many more. 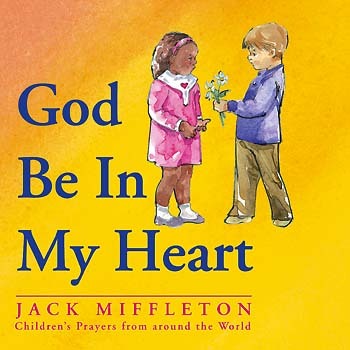 God Be in My Heart also contains devotional writings by famous authors and poets such as Victor Hugo and Ralph Waldo Emerson. These prayers paint vivid pictures that will find a permanent home in a child's daily devotions. Colorful illustrations bring the text of each prayer to life, making it the perfect tool to help children earnestly reflect on the meaning of these "Words for God's ears." God Be in My Heart contains more than 20 classic prayer songs that span oceans, borders and generations. You'll find prayers from Africa, Chile, Ecuador, Scotland and Pakistan set to music that reflects their origins while simultaneously adding dimension to the spoken or written texts. Children will love listening to and learning prayers that are used by children from different ethnic and cultural backgrounds. This treasury of short musical pieces for home, church and school includes Christmas prayers, bedtime prayers, prayers of petition, prayers of thanksgiving and praise and many more.